As a financial advisor, there are many difficult aspects of the financial planning industry, and managing client expectations is often one of the most difficult — and usually most frustrating. Although most advisors serve clients who are generally reasonable when they lose value in their investments, there are certainly clients who express their frustration either face-to-face, over the phone, or through a harsh email. While many advisors and investors come across these type of clients throughout their careers, there are many things that they can do to prevent client frustration and outbursts. How can financial advisors do this with an unpredictable stock market that is constantly fluctuating? The simple solution is to create and set their expectations within the boundaries of reality. While setting client expectations sounds like simple financial planning work, it can take some time. However, when clients are better educated about what they can expect from an advisor’s services and their investments — in addition to the client-advisor relationship — they are less likely to become frustrated when things happen that are beyond the advisor’s control. 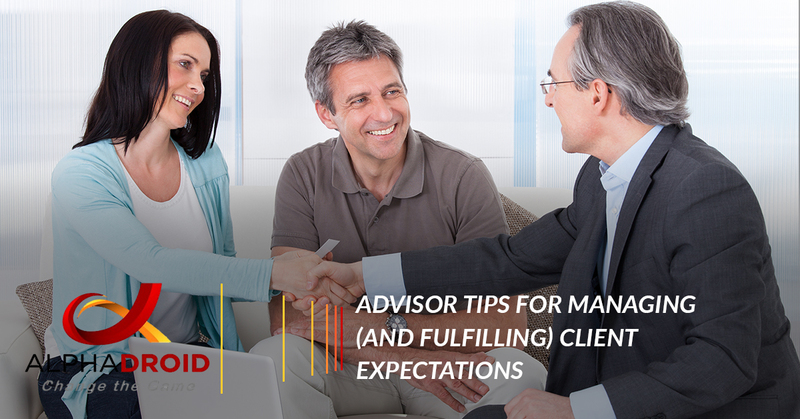 Because it is essential for financial advisors to create and establish realistic client expectations, we put together some tips and advice that will likely benefit the advisor-client relationship. As a financial advisor, planner, or investor, the first step before any type of investment is educating the client. While it is always important to educate clients, it is vital to educate the clients that have little experience or exposure to investing their money. In fact, many people seek financial planning services after hearing about the huge profits their friend or family member made from a certain investment, having the expectation that they will experience the same success. Unfortunately, these are the same people who aren’t generally familiar with the risks involved with investing, let alone the odds that may be against them, in order to realize the kind profits their friends or family gained. It is therefore essential — and, of course, a financial planners duty — to provide clients with a realistic expectation based on past market performances right from the get-go. Being able to determine the amount of risk that a certain client can take is important when discussing the variety of risks related to different types of investments. One of the most difficult facts that financial advisors and planners have to explain to clients whose expectations are not met, is that the performance of their investment is almost always relevant. When clients become frustrated or unhappy with their returns they are receiving from their portfolios, it is imperative that their advisor reminds them of how their investments are performing compared to the overall stock markets. If advisors have clients with investments that have grown seven percent in a year, the client may not feel like they are getting much of a return. However, if the advisor explains that the benchmark indexes had dropped by seven percent that same year, the client will feel better about their investments, as well as their trust in their advisor. As long as an advisor’s client’s holdings are performing well or exceeding market performance, they will have a solid defense against any of their client’s complaints. As long as advisors don’t promise their clients a minimum rate of return regardless of how the markets are performing, they should not hear as many complaints. If all of an advisor’s client’s portfolios performed well, we wouldn’t have to worry about them being unhappy or outraged with their investments. Unlike a situation where a certain client’s portfolio is performing well if their return rate is below the markets, advisors will need to be able to provide a good explanation. While there are numerous approaches to this, many have success with matching their client’s investment performance with the goals that they set at the beginning of the advisor-client relationship. If their portfolio is growing at an efficient rate to reach those set goals, then external market performance is practically irrelevant. While portfolio performance is the main focus of client expectations that need to be created, established, and managed, there are other areas of focus where clients can often be demanding. For example, clients who feel displeased with the performance of their portfolios may try contacting you several times a day to find out the position of their holdings. Plus, they might get upset if you don’t answer or return their calls, texts, or emails. It is vital to establish realistic boundaries with your clients regarding the levels and types of services that advisors will provide their clients with — and stick to them. It doesn’t matter if an advisor is fee-only or compensated in another way, the price they charge their clients is a measure of the value of their services. Still, many advisors will have clients that will expect more for less, or that are not aware of the benefits their advisor provides them with through research, profiling, and design. This is an issue that is likely to come to the advisors that offer price-based services. If advisors have a client who is notorious for being a consistent caller or messenger, it is good to set the boundaries early and let them know that their time is of value and that they want to be able to give their other clients the same level of service. If advisors have clients that are worth keeping, they are generally the ones who will respect this. Other clients may expect their advisor to provide them with a handful of free services, like free income tax preparation or a free financial plan. If advisors charge their clients for these services, it is essential that they have all of their clients pay for them, too. Failing to do so will open the door for other clients expect or demand similar treatment. No matter how much services advisors provide, no matter how much they twist their back to please clients, there will always be certain clients who are more troublesome than they are worth. If an advisor has a client that refuses to understand or respect the set expectations and boundaries, it may be best to cut the ties. These clients can make an advisor’s jobs stressful, overwhelming, and it can take away from the service they provide to their other clients, potentially hurting their financial business. Financial planners, investors, and advisors will always come across unpleasant clients who are impossible to satisfy, but a great deal of conflict, dissatisfaction, and outrage can be avoided if advisors take the time to educate their clients and set realistic expectations, goals, and boundaries. In addition, advisors who only promote their clients what they can deliver will be much less likely to experience unhappy clients. Lastly, meeting with your clients at a regularly scheduled time will give advisors the opportunity to accomplish managing client expectations. Need Help Fulfilling Client Expectations? When many clients choose to invest, their expectations generally run high when they are putting money into professionally managed accounts. But how can advisor’s have more success in fulfilling these expectations? The answer: AlphaDroid. AlphaDroid is an elite investment portfolio management tool that empowers financial advisors to compete on an investment performance basis with the powerhouses of Wall Street.This financial software contains various algorithmic trading strategies, such as the StormGuard-Armor algorithm — one of the most advanced market safety indicators. AlphaDroids algorithmic strategies make decisions based on what is already happening in the market, instead of basing decisions off of cycles, patterns, correlations, or opinions of what is predicted to happen. This enables financial advisors to identify asset classes and sectors that are showing strength in any market condition, even if the strongest asset class is cash. With AlphaDroid, advisors will be better equipped to improve returns and avoid risks with their client’s portfolios. Interested in learning more about our algorithmic trading strategies? Visit our site today!